Turkey Tail by Equine Matrix is the single mushroom species Trametes Versicolor. Turkey Tail contains powerful polysaccharides to help support the immune system. Provides natural antioxidants for a wide spectrum of helpful properties. Supports a healthy gut and ulcers. One of the most researched of all the medicinal mushrooms for its powerful polysaccharides. 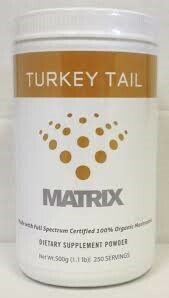 The beta glucans and other nutrients found in Turkey Tail support immune health.